We manage the world we are living an invisible power that people have always believed. The big world system administer from some specific and hidden powers. Absolutely, this power is United Stated in world. Moreover, America and all over the world command by Corporatocracy. This power is enormous and there are big companies such as, IBM, Microsoft, Exxon and some big constitutiones such as, Nato, IMF, Federal Reserve, Nasa, Pentagon. System of their is capitalizm and it is really pitiless also Their plansa re durable and hidden so I explain corporatocracy and their constitutiones in this essay. Primarily, Largest factor on the formation of Corporatocracy is Nato. This is United States military systems. This power to end with the Corporatocracy by The second world war and used by many countries of the clandestine. For Example, Italy's government as state cooperation with NATO but its planned name is Gladio in italy. Gladio is used by Nato and Corporatocracy in italy and Italy's government damage this situation in a badly. Moreover, This formation causes some economical and global problems in italy. However, Gladio been deciphered by Italy's government and in cooperation with NATO is managed by the Corporatocracy has been understood. Another example is Turkey, After 1950, Nato and Corporatocracy planned hidden formation in turkey and this formation name is Kontrgerilla. Turkish Military(TSK) and Turkish intelligence service (Mit) wanted to explain this plan but Unfortunetly They couldn’t solve them because Corporatocracy and Nato grown many agents and spyies in turkey so turkey has encountered numerous problems. Corporatocracy succeeded in Turkey. 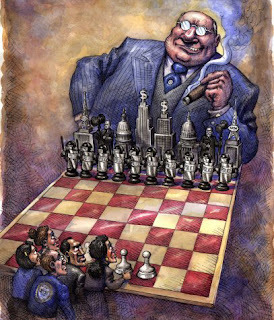 Lastly, Corporatocracy has the power of the capitalist system dominates. These powers are made up of important family and financial system. There are Federal Reserve, World Bank, IMF, Rockefeller family, Rothschild family, Morgan family, Jacob family. The main objective of the U.S. economic system, economic agents by sending countries lend money to countries with IMF or World Bank. Economic Hitmans bounded CIA and Pentagon which is the U.S.A Military army buildings. To Demostrate, If I am in the name of economic agents Kemal Derviş in turkey. IMF sent by the bank in the country and the system of financial balance by mixing an impasse the country into crisis and from crisis to exit the imf has provided loans to be taken. Taken from IMF debt is a fact that can not be paid any time. In Conclsion, Corporatocracy is the world's largest power. This power determine economical system, bank system, energy system and administrate all over the world. While many units use them such as; CIA, Nasa, IMF, World Bank, Pentagon, Federal Reserve, Nato, Big Companies so They owner and creator of the Money. Many Countries depends on their systems.